Socca (in Provence) and farinata (in Genoa) are the same thing, a chickpea crepe batter cooked in a very hot pan like a pizza. It's served as a snack and is true stret food in both Nice and Genoa. In Provence, socca and cade (another name) go back at least to 1860. 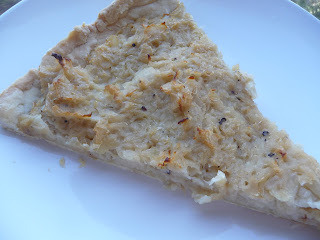 Cade de Toulon, probably the more ancient of the two, was made from corn flour and the socca de Nice that evolved from it is made from chickpea flour. There is a version in Marseilles made with a mixture of flours which they call tourta tota cada, meaning “hot tarts.” It was mentioned in 1879 by Frédéric Mistral as gâteau de farine de maïs qu’on vend par tranches à Marseille (corn flour cake sold by the slice in Marseilles). Socca was a favorite morning meal for workers who bought them from itinerant socca sellers who cooked them from wagons fitted with charcoal ovens while they cried cada, cada, cada or socca, socca, socca caouda. 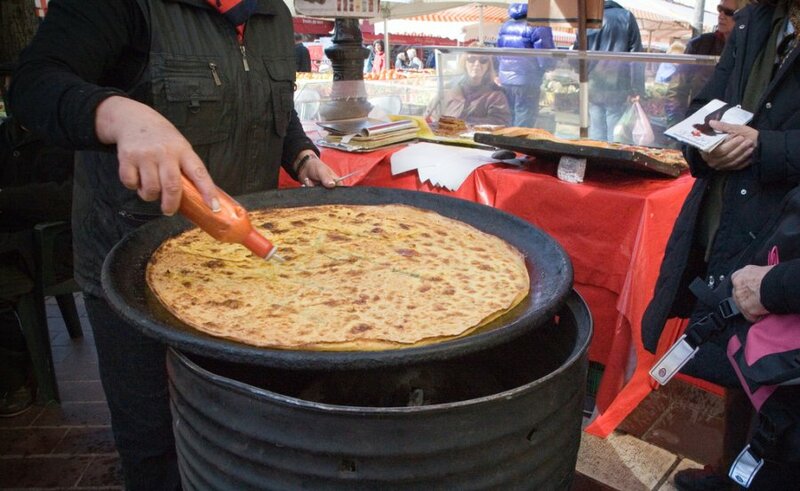 The traditional socca is made on a copper tin called a plaque a round cooking surface about 2 feet in diameter that sits in a very hot wood fired oven. It cooks until the top is golden in about 5 minutes. The batter should be thinner than crêpe batter, almost like milk. Grilling duck, while delicious, is not a casual matter. One must consider what happens to all that fat that will drip out and most importantly that it does not drip onto the coals which will simply ignite it and incinerate your duck. So there's two steps which will assure a good grilled duck. It might be easier to split the duck in half lengthwise then place it cut side down in a deep casserole and bake it at 375 degree F in your oven until you have at least 3/4 cup of fat. Build the charcoal fire in your grill's firebox to one side and place an aluminum drip pan on the other side. Take the roasting duck from the oven and place the duck over the drip pan in the grill, use the cover, and grill until the duck has a deep smoky mahogany color. Biscotto is singular and it is, basically, an Italian cookie or biscuit (same meaning: twice cooked). Decided to test today the beccute from the Marches popular in Ancona. It's very easy to make: mix flour, sugar, almonds, walnuts, pine nuts, dried figs, raisins, and water, form little rolls and bake. That's it. Very nice.